The science of wounding ballistics is a mature one, but it is subject matter that is overlooked, ignored, and misunderstood. It isn't a romantic topic, perhaps the reason the fundamentals of wounding ballistics are ignored, misrepresented, or just plain lied about? The terms used to describe shotshells and their performance are often clumsy, tortured, and inaccurate. Part of it is likely spill-over from big game animal hunting terms, like knock down. Though it is easily shown that a big game animal cannot be knocked down unless the shooter is equally knocked down, the gushing stories of knock-down persist. It is Newton's Third Law of Motion, published in 1687, but still animals are swept off their feet and the cartridge with tremendous knock-down is supposed to mean something. It doesn't. So it goes with the fun-filled world of shotguns and shotshells, where the terms of mass and weight are used interchangeably, and energy is clumsily co-mingled with other terms like trauma. Trauma just means wound or injury, its roots in Greek were not marketing terms nor were they precise. It is a very long ways away from the goal of the sportsman which is not to just wound or injure at all. The idea, of course, is a quick harvest with 100% game recovery, seeking to just injure something isn't a part of the equation. In fact, avoiding just injuring or crippling is the intent and the achievement. A bird's anatomy bears little semblance to a big-game animal or a mammal. Consider the anatomy of a teal, with small lungs but nine air sacs. 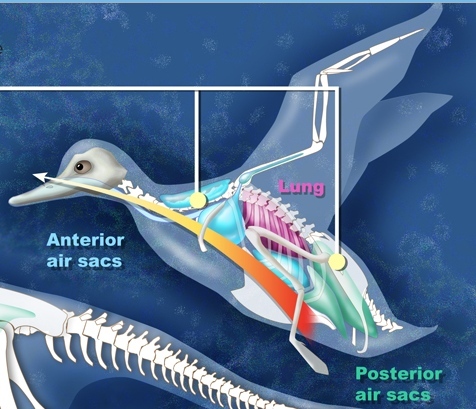 Pulmonary air-sac system of a Common Teal (Anas crecca). a. Latex injection (blue) highlighting the location of air sacs. b, Main components of the avian flow-through system. Abd, abdominal aire sac; Cdth, caudal thoracic air sac; Cl, clavicular air sac; Crth, cranial thoracic air sac; Cv, cervical air sac; Fu, furcula; Hu, humerus; Lu, lung; Lvd, lateral vertebral diverticula; Pv, pelvis; and Tr, trachea (From: O'Connor and Claessens 2005). Image Courtesy: National Science Foundation. The National Science Foundation uses a graph, above, by Zina Deretsky, to show bones showing signs of connection to air sac tissue. 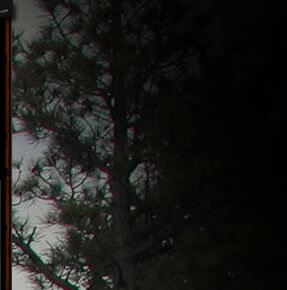 The NSF was showing a comparison between a duck and a dinosaur, the dinosaur shotgun being just one of many recent marketing attempts associated with shotguns. 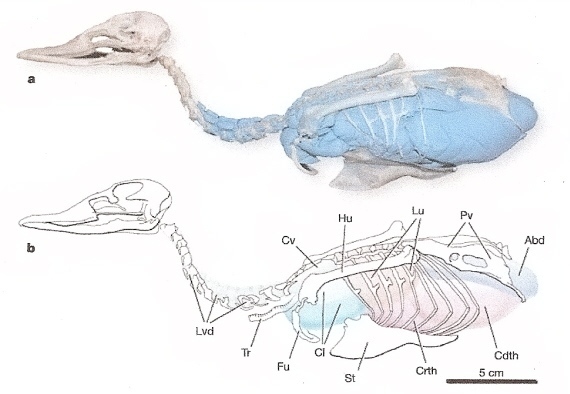 Right now, you might be wondering why the adventure into bird anatomy? While calibrated ballistics gelatin can be a good soft tissue simulant and penetration comparative tool as advanced by Dr. Martin Fackler, it has its limits. You can't kill ballistic gelatin, much less quickly kill it, for it is never alive. It has no internal structures at all, nothing remotely like a bird. It has no air sacs or respiratory system, no bones, no neck, no spine, no circulatory system, and no feathers. The only accurate measure of lethality on a bird is testing on a bird. Scientific testing is not just one-incident reporting, nor is it designed to merely show a possibility. The goal of the best studies and testing is not to launch an ad campaign at all, but to qualify not only what might work, but what works best and why. A .410 with #7-1/2 shot can kill a wild pheasant and a 20 gauge with #7-1/2 shot can kill a Canadian goose. I've done both. But neither is a preferred approach, much less the better or best approach. A huge variable is range, something only the individual hunter can control with his judgment. Shotshell ballistics were not correctly or precisely known until fairly recently. A lot was uncovered by the 1968 U.S. Fish and Wildlife Service testing on over two thousand mallards. 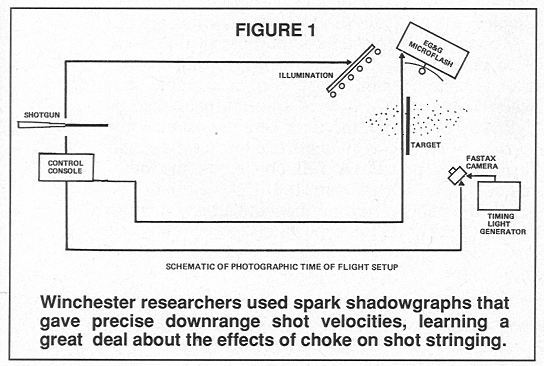 Ed Lowry wrote of this in his 1989 article, Shotshell Ballistics Reconsidered. Lowry and his team of Winchester researchers had to develop a system for not just measuring time of flight between muzzle and the target at any point downrange, they also wanted to do it for every pellet in the shot cloud. For the first time, this was done. The shotguns were fired against a lead screen positioned at various points downrange, the lead screen being illuminated on one side. 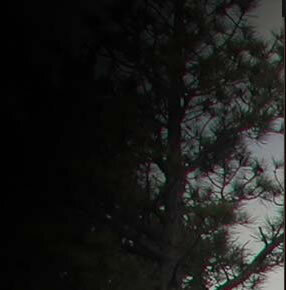 A super high-speed movie camera recorded the dark side of the screen, capturing the pin points of light as each pellet in the shot cloud went through. The millisecond timing marks on the film made it possible to to obtain the flight time of every pellet in the cloud, as illustrated above. Our shotshell program confirmed the enormous importance of pellet shape on ballistic performance. Thus what we really learned from Patuxent was not how well steel pellets do, but, instead, how badly lead pellets perform when they are unprotected from the crushing forces of setback, wrote Ed Lowry. 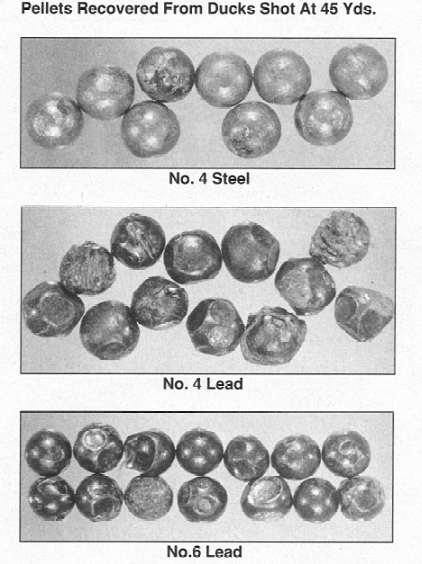 The directly measured lower strike velocity of deformed pellets and resultant impaired, weak tissue disruption was a horrible, well-recognized issue with any deformed pellet whether lead, steel, or something else. A direct quote from the end of this article, an article with the extensive, extended, expensive, empirical, in-depth testing to support the conclusion, is " . . . steel simply does not perform well at longer ranges. There are some very able shotshell development engineers in the industry. But steel's density limitation is such that no one of them will ever be able to develop an effective long range steel shot waterfowl load." Note that Ed Lowry did not at all say steel loads could not kill or could not be effective. Nor did Lowry state that steel shotshells could not be improved upon. He said effective long range, meaning as opposed to lead, similar density, or greater density materials. Indeed, Ed Lowry was well aware of higher velocities in his 1996 program, ShotShell Ballistics for Windows that accommodated muzzle velocities from 1000 fps to 1800 fps, included Kent Tungsten Matrix, Bismuth, and TTB 13 shot as presets along with the ability to put in any material density the user desired. The Bellrose Study was discussed in Oberfell & Thompson, suggesting 45 yards as the 95% bag percentage on mallards. The Nilo Lethality Model, as presented by Bob Brister, used an 80% bag rate, was 43 yards with 1-1/4 oz. #4 lead out of a full choked 12 gauge. The commonality of the best information to date, inclusive of Tom Roster, Bob Brister, and Ed Lowry along with several others is that 1) perfectly round is clearly the most lethal pellet, whether lead, steel, or some other material and 2) higher density shot wins the day along with sphericity. As to what steel loads are best for you, they are all in the same performance envelope as the density and hardness is essentially a constant. The rounder the better, what patterns best in your individual gun is the barometer. The notion that some shotshell loads "cut" more than the other has no basis in effective wounding ballistics. An obvious point is that steel loads are so hard already they tend to cut-- including cutting, scratching, and scraping your gun barrel, a well-known issue in both early loads, in CIP standard proofed barrels, and non steel proof shotguns in general. Steel is harder than many gun barrels and will scratch them without modern, super thick protective steel wads. A pellet material that can scour gun metal with no troubles has little problem with soft tissue in the first place-- they do not deform or yield to soft tissue collision. The broadside lung shot of the quadraped grass-eaters type of medium to big game does not at all apply to a bird, where the trunk, neck, and head are all potentially quite critical areas. The 3  4 pellet minimum strike, from O & T to Brister to Lowry, remains a good effective number. The shotgun lore is filled with something dying providing belated justification for most anything. You can read the interesting stories published by W. W. Greener in The Gun and its Development that were anonymous letters from sources such as "a nobleman, well-known in sporting circles, wrote the author the following in November, 1884 . . ." We liked fanciful tales back then and we still do, even though there is no usable information offered. The power of the gauge has always been more payload associated than anything else. 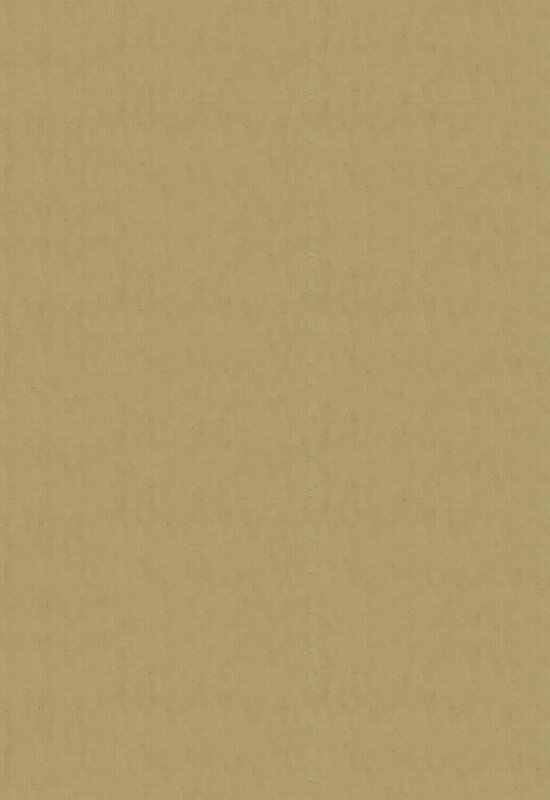 Though 2-3/4 in. 1-1/2 oz. 12 gauge buffered baby or short magnum loads have been on the scene for over fifty-five years (Winchester introduced them in 1954) the attention to lead sphericity finally showed up in 1962, when Winchester-Western introduced the Super-X Mark V shotshell with the Mark V collar. Now, of course, these many decades later it takes a 3-1/2 inch 12 gauge shotshell to throw a steel payload that weighs the same, but is less effective. 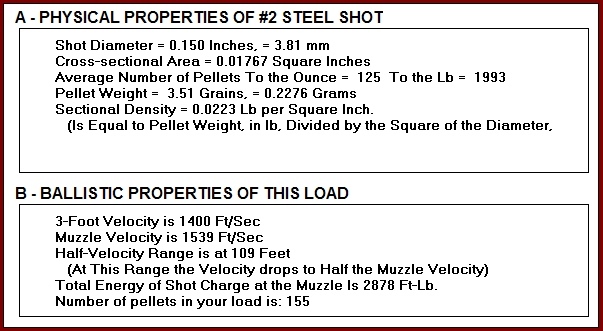 Above, I'm comparing the physical properties and exterior ballistics of #2 steel @ 1400 fps against #4 lead at 1330 fps. 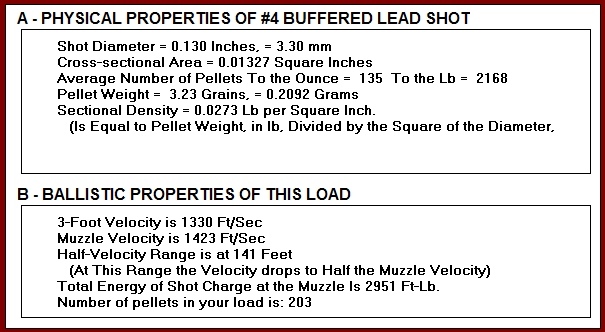 Note that the "half velocity" range of the faster and larger steel pellets is 109 ft., while the slower #4 lead has a 29% better half-velocity range of 141 ft. The sectional density of the #2 steel pellet is .0223, while the sectional density of the #4 lead pellet is than 22% better at .0273. At extended ranges, the significantly better retained velocity of #4 lead along with the superior sectional density combine to make lead a better, more lethal load as ranges increase. As noted by Ed Lowry and others, the laws of physics and specifically, the laws of motion don't change from year to year. Higher initial velocity steel loads are of minimal benefit, as it is strike velocity that counts, not the original velocity nor the amount of air a pellet needs to kill on the way to its target. Spherical steel flies best, but it is still steel so ranges are reduced accordingly to retain the same clean kill probability as lead. Don Zutz rejected the two sizes up theory for steel, opting instead for #1 steel as ideal for ducks including teal. What is the range difference? The best available version of the truth is that anything over thirty-five yards is considered "long range" for steel. Assuming the proper choke and better than average pattern placement, 40 yards is a good approximation. With lead loads, the better lead loads such as buffered loads, again assuming proper choke and better than average ability to place a pattern, a reasonable approximation for lead (or shot materials with density similar to lead) is 50 yards. That suggests about 25% more effective range with buffered lead compared to steel. The term "approximation" is purposely inserted. Certainly, some will claim steel is "good" (whatever that means) to 45 yards or so. At the same time, some will claim that the best buffered lead loads are "good" to 50 or 55 yards. You might note that those who consider themselves to be excellent shots sometimes brag about "one and a half shells per duck," or two ducks for every three steel shells expended. That of course indicates that one shot, one kill fails to happen over 33% of the time. The superiority of denser than steel materials is what got Edward Lowry so excited about the bismuth potential in the first place. Lowry was practical enough frame his comments about bismuth in terms of "potential," though, as the propensity of bismuth to fracture was a serious issue, as was the mishapen pellets, as was the inability of the Bleimeister process to produce acceptable bismuth shot above #5 in diameter. We have far better shot materials today that are approved for waterfowl. The only reason to use steel is cost as better density, as better performing shot materials suitable for all guns have long been available as Kent Tungsten Matrix and, more recently, Nice Shot. The highest density generally available loaded ammunition is Federal Heavyweight, a superlative performer for the same reason that Lowry identified from the two most extensive shotshell lethality studies ever conducted: if two pellets deposited the same amount of lethal energy, the smaller one's energy is more lethally effective. Using the best ammunition and choke you can afford isn't bad advice. That's part of what makes a sport a sport and not just poorly-advised or sloppy noise-making. How badly we decide to compromise ourselves in the field by not patterning our guns, not practicing, and using inappropriate ammunition for the game at the ranges we decide to shoot at is entirely up to us. It is largely about the respect we show our game that we electively hunt. The primary focus and responsibility of the sportsman is on his quarry, not himself. For those interested in more factual data about wounding ballistics, that information is readily available. One of the very best and most comprehensive reference works to appear in many years is Firearms, The Law, and Forensic Ballistics, 2nd. Ed., by Tom Warlow (2005). Mr. Warlow's book is a must read for anyone with a sincere interest in firearm wounding ballistics and it is an excellent general reference work as well. Edward David Lowry died of natural causes in Bellingham one year ago today, on 2009 July 22. He was born in Seattle on 1917 November 3. When his father joined the Consular Service of the United States and then was posted to Cuba, Ed moved there as a child with his parents; it was in that insular country that his brother, Jose, was born. After an interval in Cuba, Ed, his parents, and his brother moved to Mexico, where his father took up his next post, and where Ed's sister, Carmelita, was born. Ed spent much of his childhood and youth in those two countries, and became immersed in Spanish-American culture, gaining fluency in Spanish as a child; he retained this fluency for the rest of his life. And while resident as a youthful gringo in Mexico, he acquired a native's understanding of and appreciation for tauromachy. The death of Ed's father while Ed was yet adolescent precipitated Ed's return to the country of his birth, where he took up residence with relatives of his mother, in Illinois. Several years later, he enrolled in the University of Illinois, where he pursued a baccalaureate course in which he studied mathematics principally. After the University of Illinois graduated Ed, he went to work, in East Alton, Illinois, for the Winchester-Western Division of what is now known as the Olin Corporation. There he began a decades-long career as a ballistician. Although most of Ed's work was concerned with the ballistics of shot, during World War II, he worked on the trajectories of other species of projectiles. And he married Nadejda Popov in Florissant, Missouri, on 1943 March 5. Eighteen months later, their son, Edward Popov Lowry, was born. By 1949, he had been transferred by his employer from East Alton, Illinois, to New Haven, Connecticut, historically the home of Winchester, as the famed Winchester Repeating Arms Company, and where it still had a presence. Ed always regretted not availing himself of a colleague's kindly offer of a pair of tickets to the pre-Broadway tryout of Rogers & Hammerstein's musical South Pacific, with its original Broadway cast, which took place in New Haven; he had no way of knowing that the show would go on to become a smash of historic proportions. By 1968, Ed had become Director of Fundamental Research for Winchester-Western Division of Olin Mathieson Chemical Corporation. He was asked by the Manufacturing Chemists' Association to write a book that was to be part of its series Chemistry in Action. Ed agreed, and the result was his second book, Interior Ballistics: How a Gun Converts Chemical Energy into Projectile Motion, a largely non-technical study written for the interested layman, published by Doubleday & Company in 1968. His earlier book was Exterior Ballistics of Small Arms Projectiles. When, not long before Ed retired from the Olin Corporation, the issue of toxicity of lead shot arose, Ed conducted research on the ballistics of iron shot versus those of lead shot. When Ed retired from the Olin Corporation in the 1970's, he had spent his entire life as an adult east of the Mississippi. Looking for a change of scene, he and his wife decided to check out Vancouver, British Columbia, as a place to live in retirement. On their way there they stopped off in Bellingham, and liked what they saw well enough to decide to go no further; Bellingham would be their home for the rest of their lives. In the late 1970's, Ed enrolled in the master's degree program in mathematics at Western Washington University, where, as a student older than average, he amused (in a best sense of the word) and delighted many of his fellow graduate students of mathematics. He wrote a thesis, in which he expounded a waterfowl lethality model, a representation of the behavior of a hunter-shotgun-waterfowl system. It took as input the pertinent properties of the hunter's gun and ammunition, the atmospheric conditions, and the size of the target. It then produced as output the probability that the hunter bagged his target. The model did that for various degrees of the hunter's skill as a marksman, and for various ranges. After he completed his master's degree, Ed stayed on at Western Washington University as an adjunct member of the faculty of the Department of Mathematics; he taught classes at What-com Community College, as well. Besides classes in mathematics, he occasionally taught classes in computer programming and symbolic logic. Ed was the author of, besides the two books cited above and several articles on ballistics in American Rifleman, Sports Afield, and similar publications, the soft- ware package Shotshell Ballistics for Windows. Comprising nine interrelated programs, it nicely filled a gap in the available software designed for use with Microsoft's Windows: although there was analytical Windows software for shooters of rifles and for shooters of handguns, until the publication of Ed's software, there had not been any such software for shooters of shotguns. Ed continued his indagations into the ballistics of shot until shortly before his death. Ed was predeceased by his brother, Jose; by his sister, Carmelita; and by his wife, Nadejda, of fifty-three years, who died of Alzheimer's disease in 1996. He is survived by his son, Edward Popov Lowry, of Hudson, Colorado; by his brother's widow, Joyce Lowry, of Albuquerque, New Mexico; and by his niece, Margo Stewart, of Lafayette, Colorado. We will remember Ed for his keen, beautiful mind and his droll sense of humor. He was possessed of a quiet charm and unostentatious gentlemanliness that were the basis of the desire, on the part of more than a few of his acquaintances, to emulate him; he invariably respected others, behaving reasonably even when those with whom he was dealing were behaving unreasonably. Good night, sweet prince. Published in Bellingham Herald on July 22, 2010.